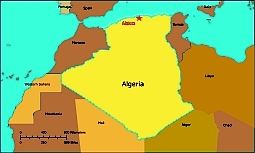 Editable royalty-free map of Algeria in vector-graphic online store. The largest of the three countries (Algeria, Morocco, and Tunisia) that form the Maghreb region of northwest Africa, Algeria is the second-largest country on the continent, surpassed in size only by Sudan. It is a little lessthan 3.5 times the size of Texas and as large as the whole of Western Europe.More than 80 percent of Algeria’s land is part of the Sahara Desert, and almost completely uninhabited. To the north of the Sahara, roughly paralleling the country’s Mediterranean border, lies the Tell region. It comprises a narrow strip of coastal plains and the two Algerian sections of the Atlas Mountains, as well as a plateau region that separates them. The Atlas Mountains cover much of Morocco and extend eastward into Tunisia. 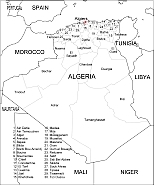 Within Algeria they are known as the Tell Atlas and Saharan Atlas systems. The northeastern corner of Algeria, where a compact massif area is broken up into mountains, plains, and basins, differs from the Tell region in that its prominent topographic features do not parallel the coast. Algeria lies on the African Tectonic Plate. Major seismic activity periodically occurs in the northern Tell ranges, threatening the lives of inhabitants with earthquakes and mudslides. About 20,000 Algerians were killed by major earthquakes in 1790. Thousands of people were killed by earthquakes at Chlef in 1954 and 1980. A land boundary dispute between Algeria and Tunisia was settled in 1993 but Libya still claims land in a portion of southeast Algeria. Algeria borders the Mediterranean Sea on the north. The major cities of Algiers, Oran, and Annaba are located on Algeria’s narrow, intermittent coastal plains, as well as the port cities of Bejaia and Skikda. These plains alternate with massifs along much of the coast, except for the easternmost section, where the coast is mostly mountainous. Algeria’s geographical diversity makes for a range of climatic conditions. The northern part of the country has a Mediterranean climate with mild, wet winters and hot, dry summers. Temperatures range from 50° to 54°F (10° to 12°C) in winter to 75° to 79°F (24° to 26°C) in summer. The plateau region has a semiarid climate, with a greater range of temperatures between the summer and winter months. Summer temperatures average 79° to 82°F (26° to 28°C) and winter temperatures average 39° to 43°F (4° to 6°C), with frost and occasional snow on the massifs. Temperatures vary the most in the Sahara Desert region, which has an arid climate. Days with temperatures of 95°F (35°C) or higher can be accompanied by nights with temperatures below freezing. Temperatures range from 14° to 93°F (-10° to 34°C), and reaching extreme highs of 120°F (49°C). The hot, dusty wind called the sirocco is common in the summer. Occidental (Great Western Erg) and the larger Grand Erg Oriental (Great Eastern Erg), where enormous dunes 6.5 to 16.5 ft (two to five meters) high are spaced about 130 ft (40 m) apart. Much of the remainder of the desert is covered by bare, rocky platforms called hamada that are elevated above the sand dunes. Almost the entiresoutheastern quarter is taken up by the Ahaggar Mountains. Surrounding the Ahaggar are sandstone plateaus cut by deep gorges, and to the west a flat, pebble-covered expanse stretches to the Mali frontier. The desert can be divided into two sectors. The northern one extends a little less than half the distance toAlgeria’s southern borders. Less arid than the area to the south, it supports most of the few people who live in the region, and most of the region’s oases are found here. The sand dunes of the Grand Erg Oriental and the Grand Erg Occidental are its most prominent topographical feature, but between them lie plateaus, including a complex lime- stone structure called the M''zab, where the M''zabite Berbers have settled. The southern zone of the Sahara is almost totally arid. Barren rock predominates, and its most prominent feature is the Ahaggar range. Vegetation in the desert, which includes acacia, jujube, and desert grasses, is sparse and unevenly distributed. Natural gas and petroleum dominate Algeria’s economy. Its natural gas reserves, concentrated in the northeastern and north-central parts of the country, are among the largest in the world, as are its phosphate deposits. Algeria’s petroleum reserves are among the largest in Africa. Algeria is also the only African country that produces mercury. Other natural resources include iron ore,bentonite, uranium, lead, zinc, kaolin, barites, sulfur, strontium, fuller’s earth, and salt. Forestry products include cork, firewood, charcoal, and wood for industrial use.